Many of us feel conflicted when buying cheap goods. You ask yourself, "How can this thing be produced so cheaply and still honor worker's rights and environmental safeguards necessary for all industry today? In "Cheap: The High Cost of Discount Culture," an Atlantic magazine correspondent looks at what may be the true cost—in economic, political, and psychic terms—of our penchant for making and buying things as cheaply as possible. From the shuttered factories of the rust belt to the look-alike strip malls of the sun belt—and almost everywhere in between—America has been transformed by its relentless fixation on low price. This pervasive yet little examined obsession is arguably the most powerful and devastating market force of our time—the engine of globalization, outsourcing, planned obsolescence, and economic instability in an increasingly unsettled world. Low price is so alluring that we may have forgotten how thoroughly we once distrusted it. 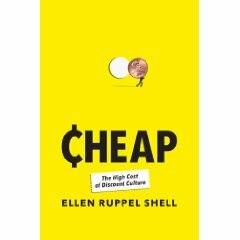 Ellen Ruppel Shell traces the birth of the bargain as we know it from the Industrial Revolution to the assembly line and beyond, homing in on a number of colorful characters, such as Gene Verkauf (his name is Yiddish for “to sell”), founder of E. J. Korvette, the discount chain that helped wean customers off traditional notions of value. The rise of the chain store in post–Depression America led to the extolling of convenience over quality, and big-box retailers completed the reeducation of the American consumer by making them prize low price in the way they once prized durability and craftsmanship. The effects of this shift are vast: a blighted landscape, escalating debt (both personal and national), stagnating incomes, fraying communities, and a host of other socioeconomic ills. That’s a long list of charges, and it runs counter to orthodox economics which argues that low price powers productivity by stimulating a brisk free market. But Shell brings forth compelling arguments from a wide range of fields—history, sociology, marketing, psychology, even economics—to argue against the conventional wisdom. Cheap also unveils the fascinating and unsettling illogic that underpins our bargain-hunting reflex and explains how our deep-rooted need for bargains colors every aspect of our psyches and social lives.